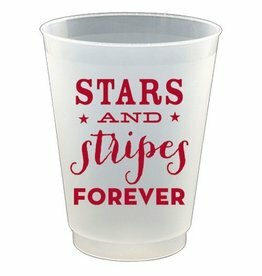 Find Patriotic Paper Napkins, Plates Cups and more for July 4th Independence day and more at Digs N Gifts in Fort Lauderdale By The Sea. Paper Dinner Plates. Set of 8 buffet-weight dinner paper plates per package. Size: 10.25 inch. Produced using environmentally sound raw materials. Caspari Paper Plates. Paper Products for Entertaining. Red and White Stripe Square Salad -Dessert Plates. Set of 8 square buffet-weight paper plates per package. 7.25 inch Square. Produced using environmentally sound raw materials. Caspari Paper Dinner Plates. Paper Products for Entertaining. 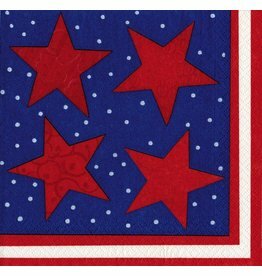 Patriotic Americana Red White Blue July 4th Themed Kitchen Towel. Size: 16x25 inches. Embroidered, 100% Cotton. Peking Handicraft Inc. Handcrafted quality handcrafted linens for the home, home fashions, holiday celebrations, entertaining and more. Size: 4x1.5x3.25 inches. 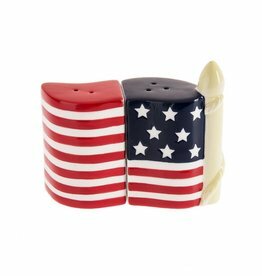 Patriotic American Flage Red White Blue Salt and Pepper Shaker set. Compostion: Dolomite-ceramica look and feel. By Midwest-CBK Home Decor Patriotic Americana Red White and Blue USA Collection. Paper Luncheon Napkins. 20 Paper Lunch Napkins per package. 13 x 13 inches open; 6.5 sq inches folded. Printed in a certified carbon-neutral facility using non-toxic, water soluble dyes. Caspari Paper Napkins. Paper Products for Entertaining. Caspari Salad - Dessert Plates. Set of 8 buffet-weight paper plates per package. 7.25 inch Square. Produced using environmentally sound raw materials. Caspari Paper Plates. Paper Products for Entertaining. Package of 8 Paper Cups. Size: 8oz. each. Everyday is a Party with Slant Collections Drinkware Paper and Party Goods, Novelty Gifts, Home Accessories and More. Patriotic, Americana, Red White and Blue Collection. Grosgrain Paper Cups. Set of 8 paper cups 9 oz each. Size: 3.75 H x 3 inch diameter. Non-toxic, water soluble dyes. Caspari Paper Cups. Paper Products for Entertaining. Size: 16oz each, Package of 8 Plastic Frost Flex Cup. Everyday is a Party with Slant Collections Drinkware Paper and Party Goods, Novelty Gifts, Home Accessories and More. Caspari Paper Luncheon Napkins. Set of 20 Paper Napkins per package. 13 x 13 inches open; 6.5 sq inches folded. Printed in a certified carbon-neutral facility using non-toxic, water soluble dyes. Caspari Paper Napkins. Paper Products for Entertaining. 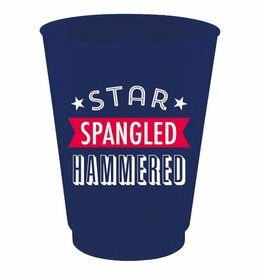 4th of July cups. Size: 16oz each, Package of 8 Plastic Frost Flex Cup. Everyday is a Party with Slant Collections Drinkware Paper and Party Goods, Novelty Gifts, Home Accessories and More.